They are particularly suitable for areas with extreme weather conditions, like in the mountains where they can supply electricity to mountain huts. 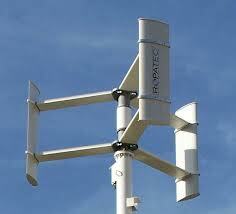 When compared to horizontal axis wind turbine they are very less efficient with respect to them. this is because they have an additional drag when their blades rotates. They are only less efficient with some (poorly designed) blade designs. There are many models that do not have much drag going into the wind, and in some cases some have wings that get more power going into the wind. This article seems to only talk about one particular style, that is over 50 years old... There has been a lot of improvements in the last 50 years. I am an engineering student. Please contact me as soon as possible via email (karim_hatem72@yahoo.com) because i need help. I am working on VAWT as my degree project. Ok, I have your request listed, I will contact you in one or two days. Thank you for contacting us. will three blade topology would not make it self starting or it will still need an external push. kindly reply. depends on the design of your vawt assembly (design). I improved and made a bit modification on my vawt design. And it doesn't have too much drag and friction. extremly smooth as silk. HAWT is more effiecient compared to VAWT no matter how many improvements have been done in the last 30years or so.